I remember watching “Batman” in 1989, with Jack Nicholson and Michael Keaton. The cinema was full of eager spectators and some were even sitting on the floor! The film was a huge success and made Batman a famous movie hero. Naturally, a game was released. 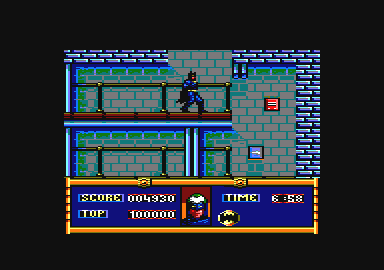 Older readers probably know the NES Batman games but I am going to talk about the Amstrad version. The Amstrad was an 8-bit computer that was popular in several European countries between 1984 and 1990 and was basically used as a game console. It was not as good as the NES but it helped establish gaming in Europe. “Batman: the movie” consists of five stages and follows the film pretty faithfully. It is a combination of shooting, platform, puzzle and racing. The first stage puts you in a chemical factory, where you must stop Jack Napier, who wants to steal some documents. You face his armed goons and deal with hot steam jets and drops of acid leaking from the ceiling. Your equipment includes an infinite amount of projectiles (“batarangs”), which you fire upon your enemies and kill them (! ), and your grappling hook, for climbing to higher platforms. There are ladders scattered around and you may also drop instantly to a lower level but if the distance is too long you take damage. Thugs carry guns or grenades and take out a small chunk of your health every time they hit you. The stage is somewhat complex, so it is not evident which way leads to the exit. There you meet Napier, whom you shoot, thus he falls into a vat of acid, transforming into the insane, deadly Joker. There is a time limit too, meaning that you must move quickly. Next, you drive the Batmobile. The screen scrolls to the right and your aim is to avoid other cars and roadblocks by taking the right turns. 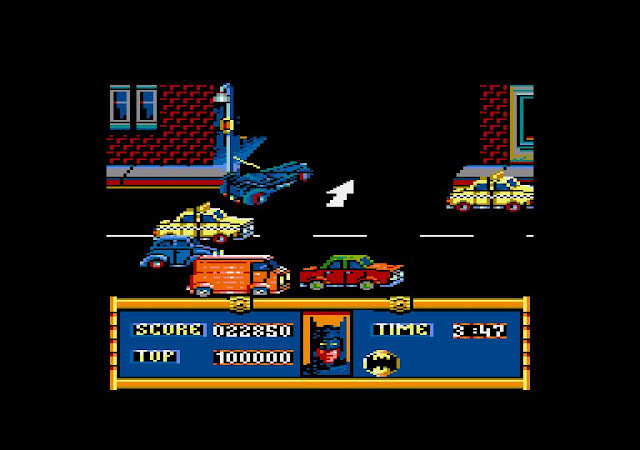 Once again time is limited, so you must use the batmobile’s grappling hook, which grips onto light posts and helps you negotiate turns faster. After that, you solve a puzzle. A group of chemical ingredients appears and each time you pick three of them you are informed how many are correct. Basically this is trial and error and you must act methodically to find the right combination. It’s a nice change of action and corresponds to the part of the movie where Batman has discovered how Joker poisons Gotham’s cosmetics market. The fourth stage resembles the second but is more demanding. You fly the Batwing and must deactivate all the giant balloons Joker has filled with poison gas. This is the movie sequence where the villain has organized a parade in the main avenue of Gotham and plans to kill everyone. As you move continuously to the right you have to fly near the ropes holding the balloons on the ground so that you cut them. If you come too close the balloon bursts and you lose some energy. If you do it right the balloon is freed and flies harmlessly to the upper atmosphere. Making a hard situation worse, helicopters charge in your direction and some balloons move up and down. The fifth stage is my favorite, along with the first. You enter a towering medieval cathedral and must reach its top floor. 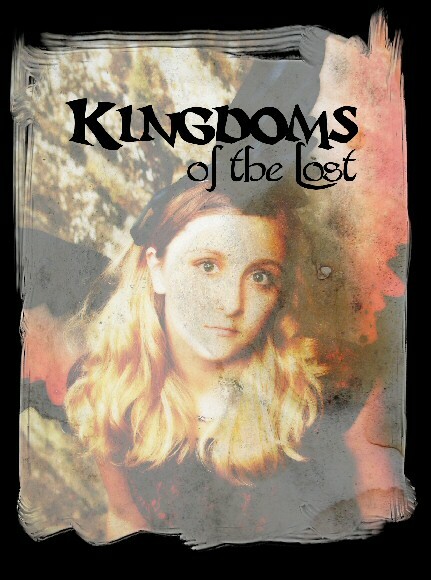 Joker’s last goons, aggressive rats and spikes are the dangers blocking your path to avenging your parents’ death. At the roof you need to shoot Joker before he escapes with a helicopter, this time dropping him on the cold concrete of Gotham streets, thus ending his short reign of terror. The graphics are very good by Amstrad standards, a machine with limited capabilities. Every stage looks different, the colors are vivid and the scrolling is smooth. I like how Batman suspends in mid-air while hanging from the grappling hook or the waving of his cape when he falls from a platform. Another nice detail is that when he takes damage an icon showing his face changes gradually to Joker’s picture. 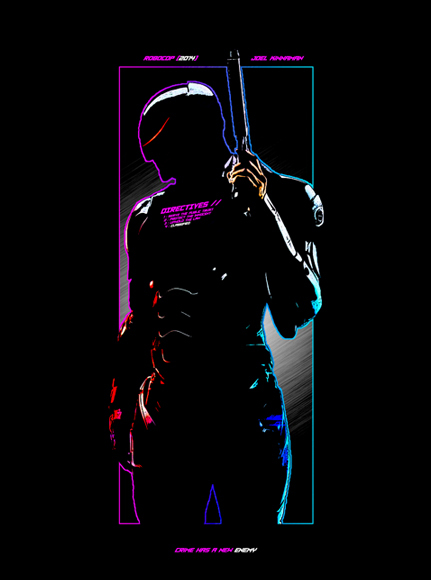 The music is memorable, some of the best on the Amstrad, and really adds to the atmosphere. The sound effects, for example the one you hear when a grenade is hurled to you, are satisfactory too. The Amstrad had a joystick with only one button, so there were few moves available. Batman can crouch, eject the grappling hook or swing left and right while hanging from a platform to control where he lands. Your sprite is responsive and your movement is accurate. The Batwing is harder to control than the Batmobile but this is a pure arcade game, so everything is simple. The difficulty is spot on. 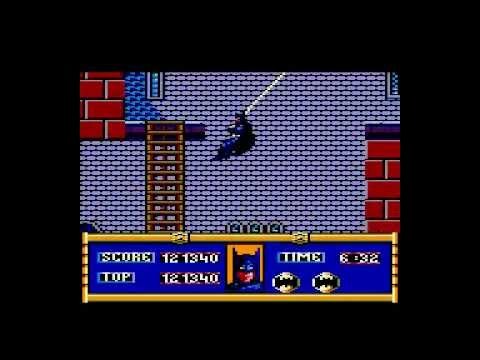 “Batman the movie” is one of the few Amstrad games that are neither impossible to finish nor easy. Each time you play you learn the stage better and progress a little further. The collision detection is perfect, every stage has the right length and the action never gets repetitive. The only thing missing is a scene taking place in the art museum, where Batman saved Vicki from Joker’s “artistic” intervention. 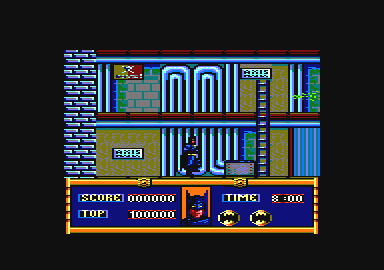 “Batman the movie” was my favorite Amstrad game and I kept returning to it even when I had completed it. It was finely crafted and made me feel like a super hero protecting a city. Of course, it is light years away from today’s complex, photo-realistic Batman productions. 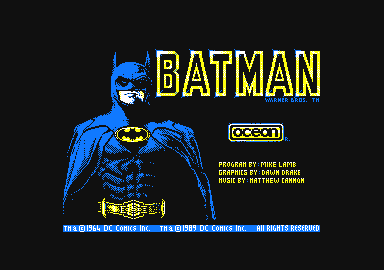 However, I am glad to have played one of the first games with the famous caped crusader.